Creating marketing collateral for a company takes branding to a new level. This is the time when a company has the opportunity to tell a more in-depth story rather than just a quick snapshot. In the case of Hooked on Nature, a non profit whose mission is to bring people and nature together, e design was given the task of creating an entire suite of materials for the organization’s “Nature Circles” initiative. 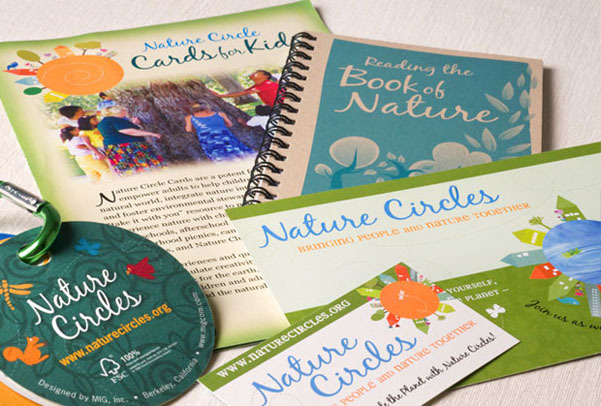 We started by creating the brand look for the entire initiative, then applied that look to business cards, website, direct mail postcards, and even a book that included lots of fun, nature-inspired activities.